On our latest roadtrip we were traveling up highway 90 on our way from St. Louis, Missouri to Manchester, New Hampshire. We have traveled that way several times as our son lives in NH. I have noticed signs for the town of Conneaut, Ohio but never have stopped in the past. This time I was needing a respite from the drive so we decided to stop for the afternoon. I knew it was a small town so I was pleasantly surprised with all there was to see. Here is a review of the sights we saw in Conneaut. In the photo at the top of this post you will see the unique lighthouse I photographed in Conneaut. The walk out to the lighthouse was quite a hike, so instead I got out my tripod and long lens to photograph the lighthouse. Conneaut is located on Lake Erie in the Northeast corner of Ohio. As the town grew in the 19th century it became a point for shipping grain, whiskey and forest products. In 1835 a lighthouse was built to facilitate ships coming into and out of the harbor. Various improvements and changes were made to the lighthouse over the years. In 1920 the old lighthouse was removed and the modern cement light we see today was built. 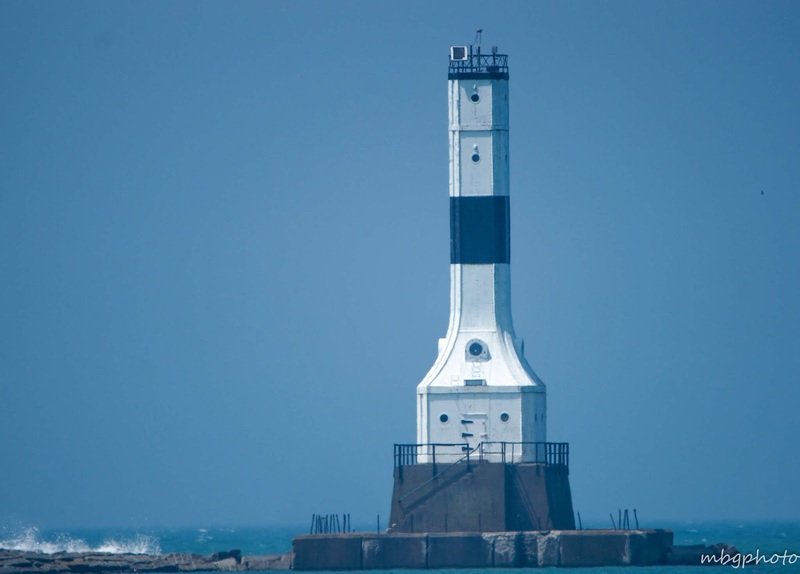 This light called the Conneaut West Breakwater Lighthouse, can be seen for 17 miles into Lake Erie. While I was photographing the lighthouse my husband got into a conversation with a local resident who was out on the harbor enjoying the beautiful day. 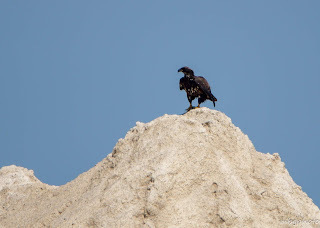 She saw my camera with my long lens (600mm) and told him about a place on the other end of the harbor where there was an eagles nest in an old tree. 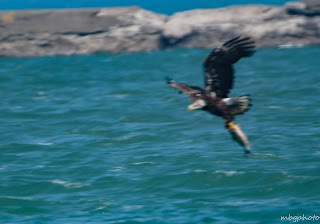 We went over to that area and had a wonderful afternoon watching the eagles. There were several juvenile eagles along with the adults. 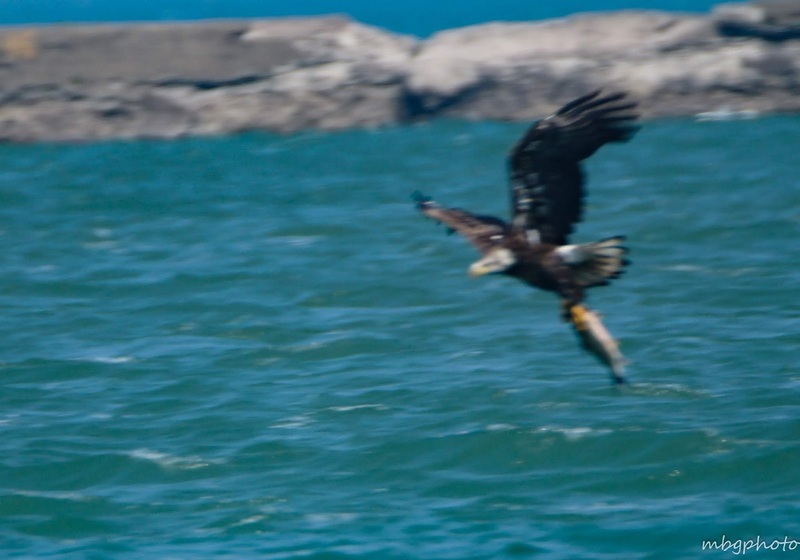 In the third photo below, I captured an adult eagle pulling a fish from the water. The map of Conneaut that I picked up showed a trail of covered bridges. There were four in the area and we took a drive and found one that I stopped to photograph. The covered bridge that I photographed is called State Road bridge and it spans the Conneaut creek. 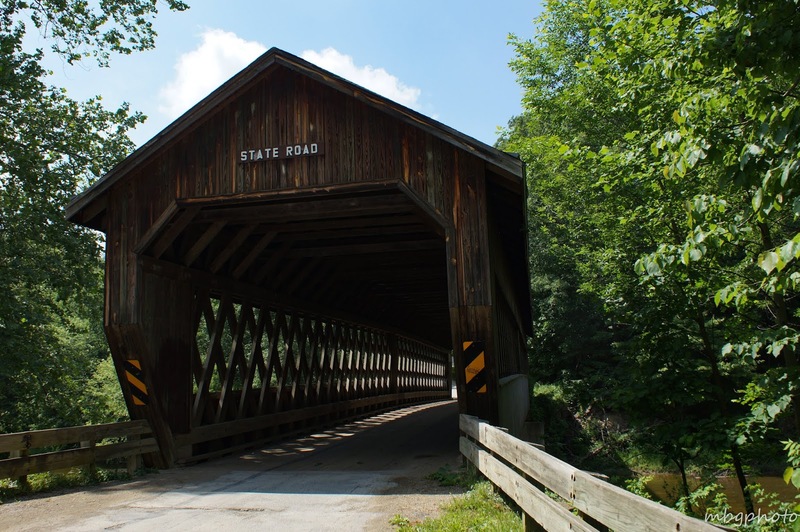 This bridge is 157 feet long and is a single span Town Truss bridge according to the sign on the bridge. It was built in 1983. Mary Beth, what fun to discover hidden treasures in a small town. The lighthouse was the perfect find for you, who specializes in photographing lighthouses! 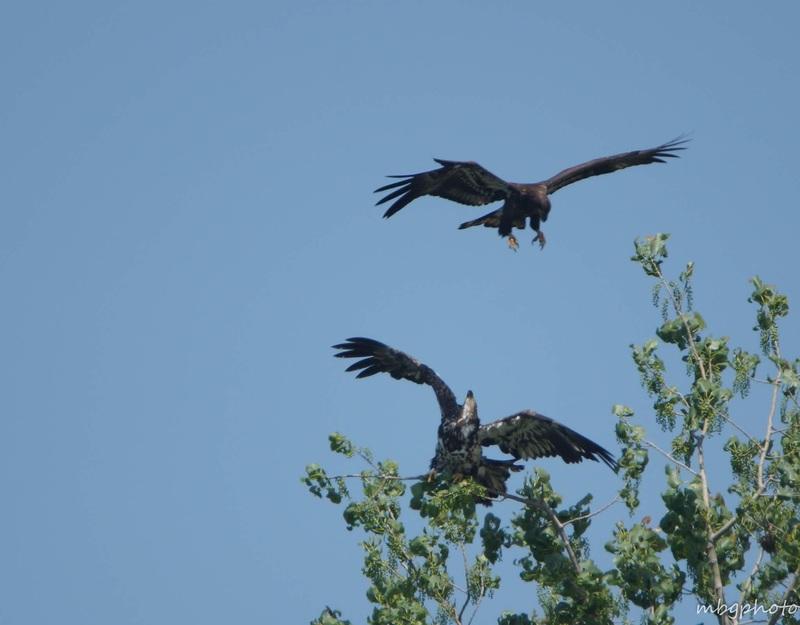 And what fun to find an Eagle's nest. Covered bridges I always associate with New England, so it must have been interesting to find some in Ohio. I've taken that I-90 drive many times traveling east to family in western New York State. Next trip I will have to make a stop in Conneaut, Ohio. Wonderful photos, as always, and interesting 'travelogue'. Nicely done. Well, I am feeling old right now. I feel like 1983 was just yesterday, yet that lovely bridge looks quite weathered. Must be the paint! At least, that is what I am telling myself right now. The lighthouse is really pretty and I love how your photo captured the water breaking on the left. I smiled at that commonality with the name of the lighthouse. It certainly looks like a nice town to visit, or live! I would imagine the daily scenery would be fabulous. Oh this looks like a wonderful place to go for a visit. I don't get over the border very often, but when I do I will put this on my list of places to see. Thanks Mary Beth for the lovely pictures. What a fun post to read. And I love the poster you created from your photos. Driving from Indiana to Maryland, and vice versa, over the years, I've stopped in some small Ohio towns on the lake. But never heard of Conneaut. Thank you for the tour. sounds absolutely beautiful and very relaxing as well. The photos are lovely as usual! That covered bridge is my fave. Am a total fan of those. It was the movie 'The Bridges Over Madison County' that got me hooked on them. Now I see them out and they kind of touch of special spot in my soul. I love exploring small towns, and this one sounds delightful. I'm sorry I wasn't along when you saw the eagles. I would love to have seen that. I once saw an eagle on my balcony rail in Templeton, but that's the only time I've seen one. It looks like your poster covers the highlights of your trip.